Comments: Broadleaf deciduous tree native to Illinois and other Mid-West states. Simple, large (4" long), deeply lobed green leaves with multiple apices. Conical in youth this tree broadens out at maturity and can attain a height of 50'. This species and Hill's Oak share many similarities, but the Pin Oak is more tolerant of moist soils and occasional flooding. 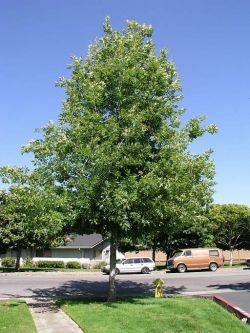 The Pin Oak is a member of the "Red Oak" group.